NEW ORLEANS – No team in NCAA Division I Men’s Cross Country has done enough through three weeks of the 2017 season to knock defending national champion Northern Arizona from its top spot in the National Coaches’ Poll. Then again, the same could be said for No. 2 Stanford and No. 3 Syracuse – as well as most of the remaining programs in the top-10. 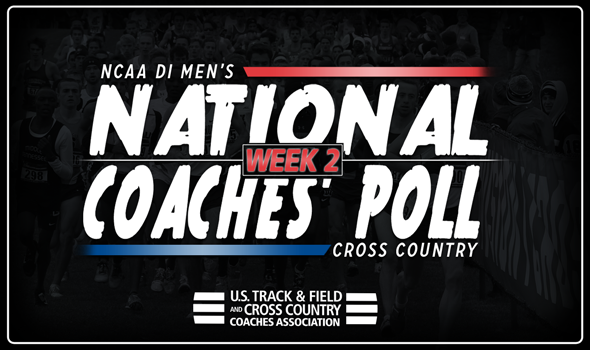 Not much changed in the top-8 of the most recent National Coaches’ Poll that was released Tuesday by the U.S. Track & Field and Cross Country Coaches Association (USTFCCCA). There were some changes, however, between spots No. 9 and No. 10, as well as No. 12 to No. 30. Oklahoma State didn’t compete this past weekend as it continues to rest for next week’s Cowboy Jamboree, but moved up one spot to No. 9. That’s because Iona struggled at its own Paddy Doyle Meet of Champions (third place behind meet champion Columbia – more about them later – and Arkansas) and fell to No. 10. Both Furman and Southern Utah moved up two spots. The Paladins went from No. 14 to No. 12, its second best ranking in program history (10th in Week 5 of 2015). The Thunderbirds are now billed No. 14, which is the best it has been ranked since it was 11th way back in 1999. Further down in this week’s poll you’ll find Indiana up six spots from No. 27 to No. 21. The Hoosiers are still riding high off early season success and are inches away from cracking the top-20 for the 10th consecutive year. Remember how we said we’d touch on the Lions, later? Well, here we go. Columbia went from No. 30 into a tie for 27th after taking down both Arkansas and Iona at the Paddy Doyle Meet of Champions. The Lions were led by National Athlete of the Week Ryan Thomas and are trending in the right direction with the Paul Short Run and Nuttycombe Wisconsin Invitational on tap. We should see some movement in the National Coaches’ Poll next week as the legendary Roy Griak Invitational takes place this weekend in Falcon Heights, Minnesota. There will be four ranked teams vying for top honors in the Merrill Fischein Men’s Gold Competition: No. 13 Iowa State, No. 18 Colorado State, No. 20 UCLA and No. 25 Michigan State. Be sure to check back in throughout the season leading up to the NCAA Division I Cross Country Championships, which will be held November 18 on the 10K tract at E.P. “Tom” Sawyer Park in Louisville, Kentucky.